Do you know anything about sheep? Let’s see, they have four feet, small eyes, and a small tail. Some are all white, some all black, some are white with black faces. When they are young, a lamb, their ears look big, but when they grow older their ears look small. Some have horns. These are called Bighorn Sheep. All sheep grow wool, called fleece, instead of fur or feathers. Sheep get their wool cut off about once a year. This is called shearing. The sheep looks big and fat with all their wool, but they look small and skinny with it sheared off. Have you seen a sheep without its wool? What do we use wool for? It is spun into yarn to make sweaters, gloves, hats and other things. When they spin the wool over and over it becomes fine thread which can be made into fabric. This fabric can be used for nice dresses, suits, blankets and other stuff. Wool is something we use to make things to keep us warm. Ask your parents if you have anything made of wool so you can feel it. The finer the wool is spun, the softer it will be. Some wool is scratchy to the skin. It just depends on how it was processed and if it is blended with any other types of thread or material. There was a large group, or flock, of sheep living on nice grassy acres of land. Their shepherd took very good care of them. A shepherd is one who looks after and cares for sheep. This shepherd was tall and strong and had dark skin from being outside all the time. His tools were a sling shot, rife, and long stick called a staff. At the top of the staff is a curve called a crook. He uses the staff to guide his sheep and as a weapon, if needed. 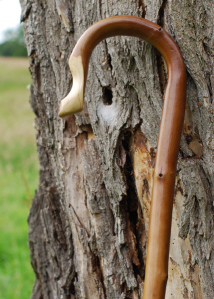 The crook can be used to redirect a sheep by putting it around its neck and pulling it this way or that. In the Spring, the shepherd takes his sheep to the top of the mountain so they can feed on the nice tender grasses and drink of the cold clear waters. In the fall, when it starts to get cold, he brings his flock down the mountain where it is warmer and the grasses are still available for food. Before he takes his flock to the next location, he leaves the sheep and goes ahead of them to check it out. He looks for signs of predators and plants that could be harmful to the sheep. If he finds plants that the sheep should not eat, he digs them up and burns them. He also looks for things that could harm the sheep like rough trails and cliffs. While there, he builds an enclosure for them to sleep in at night. This keeps them all together so he can keep watch over them. This is like a corral or a fenced yard. When he feels it is all prepared and safe, he leads them there. Some shepherds use dogs to help guide their sheep. The shepherd has chosen a safe path to get his flock to the place he wants them to graze and live for a while. The shepherd loves his sheep and they love him. They feel comfortable, protected, and safe when he is near. They recognize his voice and they love to hear him talk and sing to them. He likes to watch them, especially the young ones, the lambs. They are playful and he laughs at their antics. He treats them like they are his children. He has 100 sheep to care for and he has named them all. Some have silly names like Oatmeal or Black Face. Some are called Charley or Sally. Sheep are not very intelligent animals, so he has to watch them very carefully. Every day he counts them to make sure they are all there. Some days, he has to go find one or two that has wandered off. At dusk, while he can still see them, he herds them to the enclosure he built for the night. He lays down right there by the door to make sure none get out and a predator cannot get in. Predators are things that can hurt or kill the sheep like coyotes, mountain lions, cougars and even bears. Other predators are poisonous plants and parasites like worms that get into their skin. The shepherd checks them carefully for those small predators and looks for large predator's foot prints and other markings. He listens carefully to hear if they are near. Sometimes at night, he can hear the coyotes howling. He can tell by their howls how many and how far away they are. One time a mountain lion came and tried to catch one of the lambs. The lamb was not with the sheep, but he had wandered off. The shepherd was counting sheep when he realized one, named Spark, was missing. He knew where he had last seen him so he went there first. He arrived just in time. The mountain lion was sneaking up on the lamb. The shepherd took out his sling shot and sent a rock aimed at the big cat’s head. The rock hit its mark, stunning the cat who shook its head and ran off. The shepherd carefully picked up Spark and carried him back to the flock. This little lamb was always getting into trouble. One time, he got caught in a bramble of thorny bushes. The shepherd had to cut away the thorns and twigs to get the lamb free. Another time, Spark slipped off a boulder into the pond. The shepherd had to use his crook to grab the sheep out. Then he spent time drying him off so he wouldn’t catch a cold. One day the shepherd was counting sheep and discovered two were gone. He looked closely at the flock and realized one of the missing ones was Spark, and the other was Spark’s mother, Snow. The shepherd started looking, wondering where they could be. He had been searching for hours when he heard a “BAAA!” He followed the bleating, which is the baa-ing sound sheep make, until he came upon Snow. She was bleating and looking down into a steep gully. The shepherd approached and looked down. Not too far down was Spark who had fallen and was stuck on a bush. The bush had stopped his fall to the deep bottom of the gully and the creek below. Laying down and reaching over the edge, the shepherd reached his staff down to Spark. He had to wriggle the crook around Spark’s abdomen. Speaking soothing words, he very slowly and carefully pulled him up. Spark was shaking and bleating softly. The shepherd hugged the lamb close and Snow also snuggled up. The three sat there that way for a while. Then the shepherd carried little Spark back to the flock and wrapped him in a blanket for the night. Did you know we are like sheep and lambs? The Bible says in Isaiah 53:6a All we like sheep have gone astray; We have turned, everyone, to his own way…Astray means to have wandered off the right road or away from the right place. The Bible says that Jesus is the Good Shepherd who takes care of His sheep. Jesus says of Himself in John 10:14, I am the good shepherd; and I know My sheep, and am known by my own…When we have asked Jesus to be our Savior we become one of His sheep. Then we are being taken care of by the Good Shepherd, Jesus. That is just a picture of what we are. If we stray away from the Lord by not praying and reading our Bibles, He is sad. Our Good Shepherd calls our name. We need to come back and be near Him by praying and reading, or having our Bibles read to us, and attending church. The Bible says in James 4:8a Draw near to God and He will Draw near to you... Sometimes we do things wrong by disobeying our parents or telling a lie. Those times are when we are like Spark, tangled in the brambles or fallen off into the gully. The bushes are like the sin we have committed and are holding us down, tangling us. When we say we are sorry and ask for forgiveness it is like the shepherd cuts away the thorns and sets us free. So, little lamb, keep reading your Bibles, or have them read to you. Remember to pray and go to church. This way, you will stay close to the Good Shepherd. Remember I’m praying for you and if you have any questions for me ask your parent if you can post them in the comment box at the end of this lesson.